Posted on June 29, 2016	in All Posts, Food Safety	with No Comments on Sprouts: Just say no? 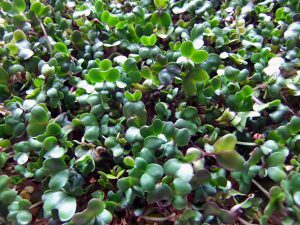 Most people have seen or eaten sprouts, the crunchy mild-tasting greens that are often incorporated into stir-fried dishes and nestled into sandwiches to add texture and color. Did you know that many food safety experts list sprouts at the top of their “Do Not Eat” lists? The term “sprouts” actually refers to a variety of small plants that can be sprouted from several different seeds including alfalfa, broccoli, mung beans and radish. While they can be an excellent source of antioxidants, vitamins and minerals, sprouts are also frequently contaminated with foodborne pathogens, some of which can be quite dangerous. What makes sprouts so risky? The answer lies in how they are grown, processed and stored before they get to your plate. While there is nutritional value in sprouts, there can also be significant risk. Raw sprouts can be a carrier for harmful bacteria including Salmonella, Listeria and E. coli. Some of these pathogens can cause more than just an upset tummy. For example, Shiga toxin-producing E. coli (STEC) are particularly dangerous. Of those infected with STEC, 5-10% develop hemolytic uremic syndrome (HUS) which can result in permanent kidney damage and even death. Listeria has a mortality rate of about 21%,and carries a particularly high risk for pregnant women and those with compromised immune systems. Consumption of raw sprouts can have health consequences that are more than theoretical and can be extremely serious. Since 1996, there have been more than 30 outbreaks linked to sprouts that have sickened at least 1,800 people. (There have probably been far more cases than this because not every illness is confirmed and reported.) Perhaps the most well-known of the sprout related outbreaks, Jimmy John’s Gourmet Sandwiches served sprouts eventually linked to outbreaks in 2008, 2009, 2010 (two outbreaks), 2012 and 2014. While the company temporarily removed sprouts from their menu, sprouts have returned in many states and some customers placing online orders have been met with a pop-up safety warning. So what is it about sprouts that makes them so risky? According to the Colorado Integrated Food Safety Center for Excellence, the source of bacterial contamination for sprouts is nearly always the seeds. The plants that initially produce these seeds are grown in typical agricultural settings. Animal manure, contaminated water and poor worker hygiene are all potential ways for the seeds to come in contact with harmful bacteria. The seeds can also become contaminated while being harvested, during storage or transportation (for example, by rodents and pests that live in a storage facility). Additionally, seeds intended to be sprouted sometimes undergo a process known as scarification to break down the seed’s outer coat and let in water. This process speeds up sprouting, but also leaves tiny holes that trap bacteria. Some of these contaminated seeds are then sent to a sprouting facility where they are exposed to warm and moist conditions to encourage their growth. Unfortunately, these conditions are also perfect for bacterial growth. In this ideal environment, bacteria undergo what is known as “exponential growth.” The concept is fairly easy to understand – one bacterium doubles into two which then doubles into four and so forth. Just a few bacteria attached to a seed can quickly become a critical mass. This bacteria then grows from the seed into the sprout itself. There is also opportunity for the sprout itself to become contaminated if it is exposed to poor sanitation conditions such as improperly cleaned equipment. 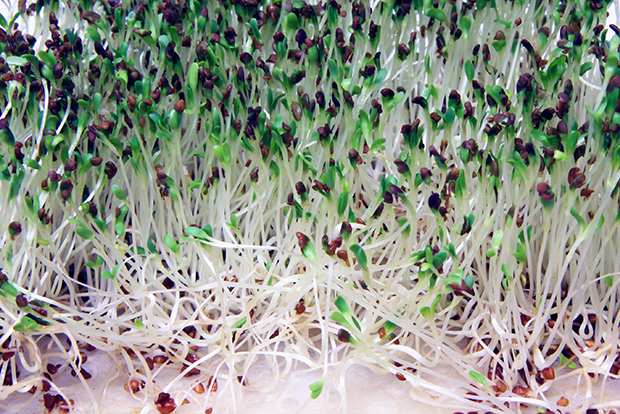 While some sprouting facilities use a chemical soak on the seeds to reduce the number of bacteria, less than half of sprouting operations use a disinfection treatment before sprouting since the final sprout output may be reduced. There is a common misconception that sprouts grown outside of a commercial environment, such as in an individual’s home garden, are safe from the risk of contamination. That’s simply untrue. Because the source of bacterial contamination is almost always the seed, a home gardener’s attention to good hand hygiene and a clean growing environment does not exempt them from the risk associated with sprouts. The contaminated seeds mentioned above are likely the same ones that a home gardener would find in a seed packet. That means home sprouters are equally likely to be starting the process with harmful bacteria present. The inevitable next question asked by sprout-lovers: can’t I just wash them? Because contamination almost always grows from the seed into the plant, washing sprouts won’t remove those risky pathogens. Per FDA recommendations, the safest practice is to cook sprouts thoroughly. I realize this isn’t always the best way to serve sprouts, but it is truly the most effective way to ensure foodborne pathogens are eliminated. This is even more critically important when they will be served to children, older adults, pregnant women and those with poor immune system function. Like with anything, most food safety experts would say that they always weigh the risks of a particular food with the benefits. Is your love of sprouts great enough to warrant the risk? That’s for you to decide. While eating raw sprouts will certainly not lead to illness every time, the high risk of contracting a dangerous pathogen is enough of a deterrent for me. Dine safely! Caitlin Saucier Feltner is a former CDC/APHL Emerging Infectious Diseases Laboratory Training Fellow who worked with the Hawaii Department of Health State Laboratories Division. Read more of Caitlin’s posts.